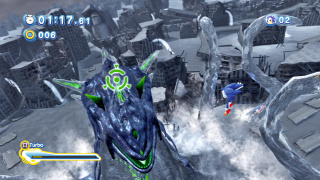 Perfect Chaos returns as a boss battle in Sonic Generations. The fight takes place in the destroyed city of Station Square as seen in Sonic Adventure. Unlike the last fight, you don't fight this monstrosity as Super Sonic. Instead, you fight as Modern Sonic, who uses the Sonic Boost to traverse the broken city streets to reach and hit Perfect Chaos. To hit the beast, you must first reach him. The fight could be considered a level, as you use various springs, boost pads, and some wall running to reach Perfect Chaos's location in the city. All throughout your travels, Perfect Chaos will attempt to hit you with its tentacles and destroy alternate routes. It will also spawn tornadoes and fire its lasers near him like its previous encounter. By using the Sonic Boost, you can then swivel through the monster's body like Super Sonic did, and hit Perfect Chaos's brain, damaging it. You must do this three times, taking three different routes to do so. After these hits, Chaos will then literally RAISE various objects around him, making you have to travel to his head one more time. One more Homing attack on his head will finally lay this beast to rest, and give you a Chaos Emerald. This page was last edited on 8 April 2018, at 09:52.